Many people assume that a Michigan wedding has to be in a church, hotel, or other type of hall. While it's true that we certainly have some wintry cold months here, we also have a huge portion of the year that is just perfect for those beautiful outdoor weddings! In the past couple of years we have had the pleasure of attending several outdoor weddings at the following two locations, and we simply fell in love with both of them. One is an elegant beach, and the other is a riverfront yacht! We can't imagine any more perfect settings for your romantic celebration of love. Of course you can always hire a Detroit wedding planner to do the job if you find it overwhelming as we know that many do. Take a look at our two choices for outdoor wedding venues in Michigan. We hope that one of them will be the perfect fit for you. You may never have thought of Metro Beach Metropark as a venue for a wedding, but they hold elegant weddings here on a regular basis! You can get married on the beach, on a boat in the marina, or in the gazebo on the point. You can literally choose any location within the park. We love that. The Activity Center itself has wonderful floor to ceiling windows, so even when you bring the reception indoors for the evening, you'll still have a beautiful view. It's very spacious, and they are able to accommodate up to 300 guests. They have a wonderful stage for the live entertainment, and a very nice warming kitchen as well. The catering is provided by Perfect Plate Cuisine, who are the exclusive caterers to Metro Beach. They have many different options for your wedding, including beef and pork, poultry and seafood, and wonderful pastas. You can reach Perfect Plate Catering directly via Christine Reling at (586) 246-2918. 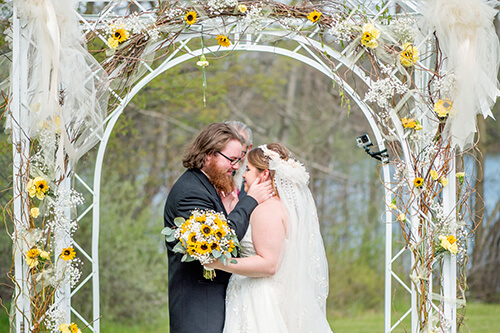 If you think that Metro Beach Metropark might be the perfect outdoor wedding location for you, you can reach them at (800) 477-3172 or (586) 463-4581 (ask for Thomas Knuth). The Metro Beach Offices are located at 31300 Metro Parkway in Harrison Township. If a beach wedding isn't what you had in mind, how about a riverfront yacht? The weddings that we have attended on the Infinity and Ovation Yacht Charters have been some of the best we've ever been to. There's nothing like celebrating your union on an open air sundeck while your guests take in the exquisite view. This is the ultimate way to appreciate the Detroit skyline, and there's no better day to do it. We love the fact that they have their own wedding planners who are available to help you plan your big day. No matter what your budget is, they can help you to stay within it. They've got exclusive pricing on things like wedding cakes, flowers, linens, photography, live entertainment, and more. You'd be wise to take advantage of those special offers if you decide to go with Infinity and Ovation. They've got many different wedding packages to choose from to fit both your needs and your budget. We also really appreciate the fact that they will customize those packages as you see fit. They understand that every couple is unique, and they are willing to work with you to make your wedding a really dreamlike experience. If Infinity and Ovation Yacht Charters sounds like the wedding of your dreams, you'll want to give them a call at (586) 773-3100. Their offices are located at 400 Maple Park Boulevard, Suite 404, in St Clair Shores.